When taking over an account it’s important to define your objectives. 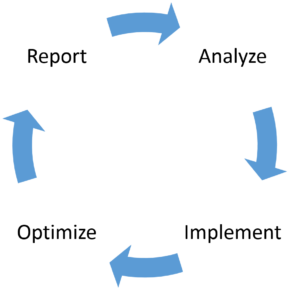 Is it traffic or conversion that you are after? Since most campaigns’ value is based on conversion, this article will be looking at how to optimize an account to increase conversion and leads. Adopt an mindset on perpetual improvement in order to create the most impact campaigns. Use this strategy with each step below to get the maximum impact. We are placing this at 0 because it’s should be something that you are constantly checking. Tracking for your campaigns is essential to measure whether your campaigns are performing. 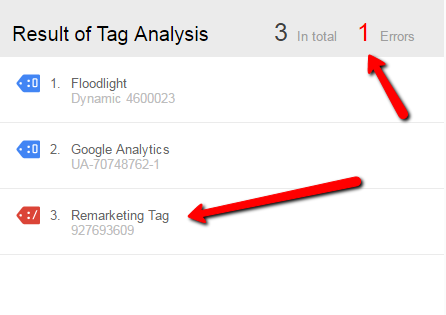 Use WASp, Ghostery, or Google Tag Assistant to ensure that tracking codes are in place. If you are running a Facebook Campaign beyond checking conversion, you can use the Facebook Pixel Checker for Chrome. In order to maximize R.O.I, you should be review your campaign limitations. Where can you get the best bang from your buck by investing a bit more. The opposite of this is pausing any campaigns that are not hitting your objectives. Once you’ve identified these campaigns, it’s important, you can use the estimator to provide you with an update budget. 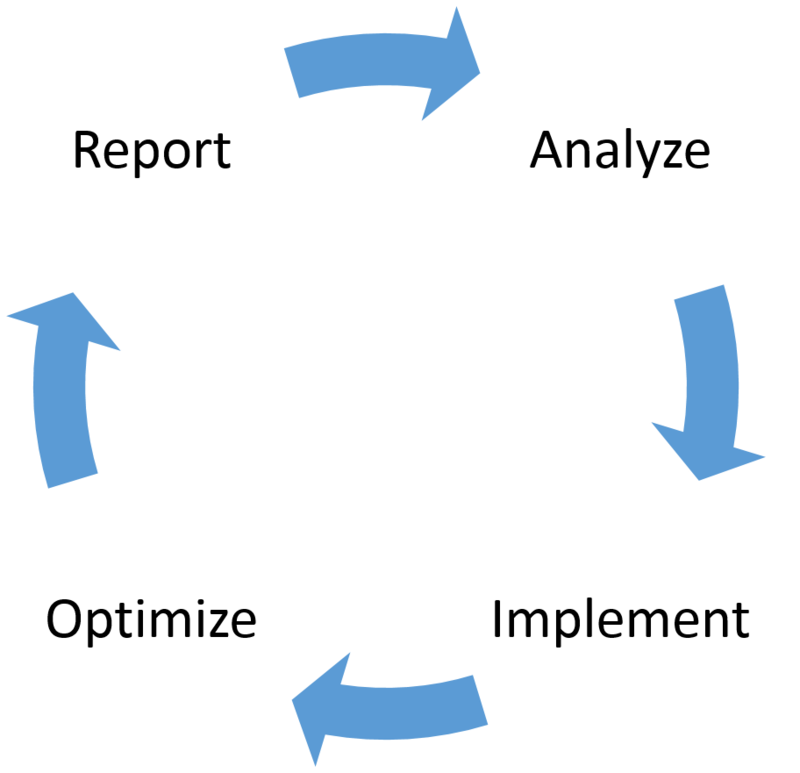 Most campaigns should be broken up into segments targeting different sections of the buying funnel. For leads, a standard CPA is a measure of campaign success. Evaluate and create a plan to improve campaigns that are not meeting your CPA goals. 3. Analyze queries to add to negatives or keywords to campaigns as needed. Evaluating your search query report is the life blood of any effective campaign. Your search queries can provide you with terms that are profitable and not profitable. The terms that are meeting your campaign objectives should be added to keywords while terms not meeting your needs should be placed in negatives keywords. Search behavior is critical part of user behavior. It can be highly dependent on the industry or the product/service. Users may use several devices and screens before buying. For example, users may perform their research on a mobile device but feel more comfortable booking on a desktop or calling. You should adjust your bids best on historical data on this subject. 5. Identify and evaluate high CTR ads with low conversion and vice versa. Relevance, Value and Call to Action. Remarketing is a powerful technique to bring potential customers back to your website. Determine remarketing audience interest and demographics with analytics. Apply these findings to your remarketing campaigns. 7. Evaluate analytics for cart abandonment and funnel behavior. What landing pages/campaigns/keywords/strategies are more effective in driving people through the funnel to conversion. What elements are causing friction. Use analytics to discover what is happening here. A general why to check your keyword coverage is to use the impression share report. This will provide you with some insight to which campaigns need to be reviewed. One of the best health checks to any campaign is quality score. This will provide you with good overview of the quality and relevance of the campaign builds. Your goal is to identify campaigns and ad groups with high spends or significant portion of the budget with low quality scores. – I know that is a great place to start optimizing & likely improve performance. Is the Account in Good Shape or Not? A healthy account would have quality scores of 7 and above for the majority of the scores for your count of keywords. Use a pivot table to create your range of quality scores . 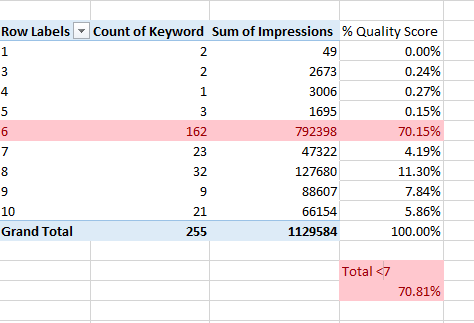 Sum of Impression for Quality Score Range/ Total # of Impressions. Use this to determine the percent of the account that is under a 7. This is a great determiner of your accounts health. Breakdown things more granular to improve.